Here’s how you can change the pricing plan you’re on for your Teamup Calendar. The Basic pricing plan of a Teamup Calendar is completely free and includes up to 8 sub-calendars and many powerful features and customization options. However, if you find that a Basic plan is not quite enough, you can easily upgrade to a Plus or Premium plan. Alternately, you can downgrade your plan if you find that a lower pricing tier is adequate. To change your plan level, open your Teamup Calendar with your administrator link. Then go to Settings > Subscription. It’s the last option on the Settings sidebar. 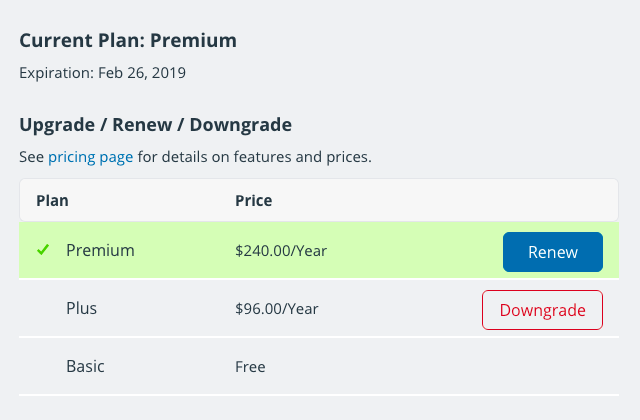 The priced plans (Plus and Premium) will have a Renew, Downgrade, or Upgrade button next to them, depending on your current plan. To renew your current plan, click the Renew button. To upgrade to the next pricing tier, click the Upgrade button next to the plan you want. If you wish to upgrade to an Enterprise plan, please contact us to work out the best plan for your needs. To downgrade to a lower pricing tier, click the Downgrade button next to the plan you want. To cancel your plan, do nothing. That’s right! Teamup does not store any payment information and will not automatically renew your subscription. When your current plan expires, you will receive an email with renewal instructions. If you do not wish to renew, simply ignore the email. If you wish to delete your calendar entirely, you can do so by following these instructions.